I recently discussed why teachers unions are important agents of social justice on “Education On Tap,” a Teach For America (TFA) podcast created by Aaron French. I really enjoyed the conversation – French goes above and beyond his promise to make the show “a little bit of fun” – and appreciated TFA’s continued (though still very young) efforts to deconstruct myths about organized labor and education reform ideas. 1. Support market forces including choice and competition as a mechanism to improve all schools. This is usually done through vouchers and charter schools. However, neither French nor I (nor Kilstein) are crazy about this term, for a few reasons. First, the group of people we call “reformers” sometimes have drastically different views on these topics. For example, opinions about the appropriateness of suspending students vary widely among people who support the rapid expansion of charter schools. Because “reformers” don’t hold monolithic views, it doesn’t make a ton of sense to lump them all into the same category. Second, using the term “reformers” erroneously suggests that only a certain group of people support school improvements. However, teachers in unions and other critics of typical education reform efforts fight for school reforms themselves; they just have a different (and, on balance, more evidence-based and theoretically sound) perspective about which reforms we should pursue on behalf of students in low-income communities. Despite misleading claims to the contrary, very few people actually support the “status quo” in education. Though the word has become associated with negative imagery for a lot of education stakeholders, nearly everyone is a “reformer” to some extent. Third, the use of a term like “reformers” reinforces the notion that there are two polarized “sides” in education debates, the “reformers” and their opponents. As I discussed with French, I believe the “sides” are much less in opposition than they sometimes appear to be, and that most people in education are in general agreement on the vast majority of issues. The more we can deconstruct the notion of “sides,” the better. That said, I don’t have a great solution to either the first or third problems (for the second, I’d recommend that we use clunkier phrases more like “proponents of market-driven reforms to education” and “advocates for a comprehensive social justice approach to education policy” when we can). Categories can be useful for brevity’s sake, and as is evident below, it’s hard to construct an argument while avoiding categorization altogether. Still, I think it’s worth reflecting on our naming conventions as we endeavor to be more nuanced. 2) Why unions are power-balancing advocates for low-income kids: French explained during our discussion that many people believe the San Jose Teachers Association (SJTA, the local union for which I served as an Executive Board member from 2012 to 2014) to be an atypically progressive union. In reality (and I believe French agrees), the vast majority of unions, including national teachers unions like the National Education Association (NEA) and American Federation of Teachers (AFT), are some of the most power-balancing institutions out there. Recent research by Martin Gilens confirms this fact: unions consistently advocate on behalf of less advantaged populations on a wide range of social justice issues. They serve as an important counterbalance to wealthy interests and exploitative policies, and have made extremely important gains for working Americans throughout their history. 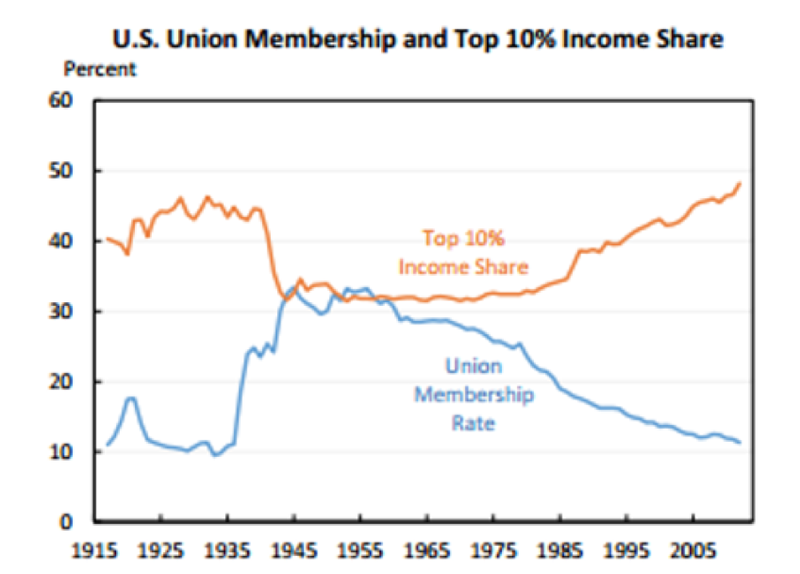 It’s probably not a coincidence that the steep decline in unionization over the past thirty years has coincided with a steep increase in earnings, income, and wealth inequality. That doesn’t mean unions can’t be wrong on certain issues. We should absolutely condemn the behavior of police unions that defend racist positions, for example, and demand that they be held accountable and change. Teachers unions shouldn’t be immune from criticism, either, and it’s imperative that we confront them when we believe their positions are misguided. Not all teachers unions have realized their potential as social justice unions just yet, and while I firmly believe that a different approach from the education community would help more of them do so, organized labor must also proactively analyze and revise practices that don’t fit its mission. Yet we must also remember that teachers unions have very strong track records on behalf of low- and moderate-income families, and more credibility as advocates for low-income kids than many of the people and organizations who malign unions. Even if you think certain teachers unions are wrong about aspects of education policy, it’s completely inaccurate to argue that their existence harms low-income kids. The empirical evidence is clear (much clearer, in general, than the evidence about education policy ideas) that teachers unions are a major net positive for low-income populations. There’s joint responsibility to change the tone of education conversations, and union members must avoid becoming reflexively defensive when confronted with criticism. We do ourselves and our students a disservice when we react by ignoring people outright or slinging insults right back; instead, we should try to understand the legitimate elements of critiques, address them, and educate people on where they’re wrong and how to have more productive dialogue. At the same time, union members and leaders are understandably offended when proponents of market-driven reforms (making an attempt!) imply that union opposition to these reforms is borne of laziness, selfishness, and/or incompetence. Everyone needs to remember that teachers in unions, who are directly student-facing and who will actually implement education reform ideas, typically have good ideas about what students need, and that both private and public sector unions are important advocates for low-income people in general. While there is some shared responsibility, the tone of the debate cannot change until proponents of market-driven reforms acknowledge these facts. The sooner anti-union messaging becomes a thing of education reform conversations past, the sooner we can collaboratively develop great policies for students. A big thank you to French for having me on the show, and hope you enjoy the podcast!